Six Nations - How will Vern Cotter's Scotland team fare? Venue: Stade de France, Paris Date: Saturday, 7 February Kick-off: 17:00 GMT Coverage: Live on BBC TV, HD, Red Button, Radio 5 live, the BBC Sport website, mobile, the BBC Sport app and Connected TV. 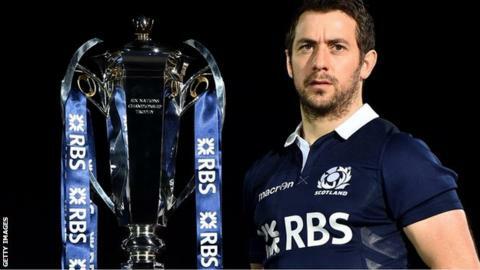 Scotland head into the 2015 Six Nations Championship with more optimism than at any time in recent years. The arrival of Vern Cotter as head coach has heralded an upsurge in the national team's fortunes. An encouraging autumn Test series - featuring wins over Argentina and Tonga, and a narrow loss to world champions New Zealand - has breathed new belief into a Scotland support that has for so long watched their team play the part of mere whipping boys to England, France, Wales and Ireland. After a dismal 2014 Six Nations, the Scots are now displaying an attacking verve to excite the fans and, crucially, appear to have cracked the long-standing conundrum of turning pressure into tries. Scotland begin their campaign with a trip to Paris to take on the French, before home matches against Wales and Italy. They will attempt to break a 32-year winless run at Twickenham against England before rounding off the tournament at home to Ireland. So how will Scotland fare in this year's tournament? BBC Scotland spoke to three ex-Scotland internationals to assess the team's chances. Chris Paterson (CP) is Scotland's all-time record cap holder with 109, and with 809 points he is also the national team's record points scorer. Andy Nicol (AN) is a former Scotland captain, leading his side to a famous Calcutta Cup victory over England at Murrayfield in 2000. Peter Wright (PW) represented Scotland on 23 occasions, and toured New Zealand with the British & Irish Lions in 1993. CP: "I think we're always optimistic as Scotland fans, and rightly so as we often win games that people think we shouldn't. We've got a great spirit and determination within the side that always gives us an opportunity to win. "The excitement's there. The expectation comes from the autumn. Three good performances, two great victories, 11 tries in three games and 94 points, so the attack worked well. The defence, which is built on the tenacious nature of our players, was fairly comfortable as well." AN: "I think we can be optimistic, but with realism as well, because what we know from painful experience over the last number of years is that the Six Nations is a really, really tough competition. "The autumn Test series was good, very encouraging. Two very good wins and a very good performance against New Zealand. Some of the young players really stepped up and really looked like quality international players. They need to kick on now." PW: "I think we're always optimistic, but this time I think we've got the right to be. I think the performances and results in the autumn internationals give us that right. "I thought we looked like a good rugby team, and that's something we've struggled to do over the last 18 months. The style that Vern Cotter has brought in gives me more optimism than anything." CP: "I think he comes across as a terrific leader, a terrific man. One of the keys to his success was just coming in and asking the Scottish people, the Scottish players and former players what has made Scotland successful in the past. "He's embraced his new culture. He has a nature about him that you as a player would have a huge desire to impress him. I think he suits us." AN: "I think he's brought real clarity to what they're looking to achieve. He's got the team playing to their strengths. "I have been impressed. He's got everything pretty well bang on since he came here, so let's hope that continues." PW: "He's just given the game back to the players. There seems to be a lot more confidence coming through, you can see that in their body language. "He's letting the guys play their more natural game, which is what Scotland need." CP: "Success can be measured in a whole host of different ways, but ultimately it'll be down to performance. "If they get the accuracy in the performances then I think they can produce good results like they did in the autumn." AN: "We're going to be competitive in every single game. I think we'll get two wins, and I think if we play really well we could get three wins." PW: "I think it's about results. They've got three home games which you'd think they could win. The two away games are obviously tough. "If they win three games out of five I would see that as a success. With a wee bit of luck maybe they could push for the title. I think every team apart from Italy could potentially win the competition this year." WHO WILL BE SCOTLAND'S KEY PLAYER? CP: "Alex Dunbar. I'm really excited to see him. He's played well for Scotland in the past. He's a try-scorer for Scotland and for Glasgow. "It would be great to see him fully fit, working in a midfield with Matt Scott or Mark Bennett." AN: "Jonny Gray. I've been really impressed with him this season. He's really stepped up. He was outstanding in the autumn Tests. He's been consistently good for Glasgow. "I expect him, alongside his brother Richie, to be a key player for Scotland in the Six Nations." PW: "Rob Harley. His attitude, putting his body on the line, his whole ethos to the game I just think might galvanise the rest of the team. "The way he plays the game is what we want. I think he'll be a vital player, if he's fit." CP: "I used to love playing in Paris and I liked to play against the French because they let you play. They allow you to play a little bit more than the likes of Wales who are rushing up on you in defence. "It's a great game to play in, but we're under no illusions. It's a big, big ask to get anything from a game in Paris." AN: "If you don't win your first game it just puts you on the back foot. The Six Nations is all about momentum. "Bear in mind Glasgow beat Montpellier and Edinburgh beat Bordeaux and Lyon over there, so the players will be full of confidence that they can go to France and win." PW: "You're never quite sure how good France are going to be. But Scotland's form individually and collectively with Glasgow, Edinburgh having started to come into a bit of form, the autumn internationals - put all those factors together and I think we've got a fairly decent chance to be competitive in Paris. "If you're competitive, if you get the basics right, you give yourself a decent chance to win the game."